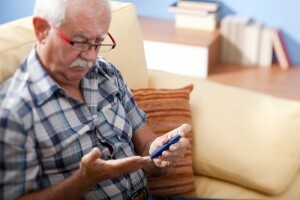 Diabetes mellitus is a chronic disease which affects 16 million people in the United States alone. Every day about 2,200 new cases are diagnosed. Roughly 15% of all diabetes sufferers will inevitably develop foot ulcers. Ulcers occur most often on the ball of the foot or bottom of the big toe, usually where an area of skin has been damaged. Generally the skin will heal quickly if it has been cut, but in patients who suffer from diabetes the skin on the feet does not heal normally. Diabetics are therefore prone to developing an ulcer. Depending on the patient, it may take weeks or even several months for foot ulcers to heal. Diabetic foot ulcers are responsible for more hospitalizations than any other complication related to diabetes. It is also the leading cause of non-traumatic lower extremity amputations in the United States. Foot ulcers contribute to almost 85% of all diabetes-related amputations. The treatment of infections, amputations, and hospitalizations due to foot ulcers cost billions of dollars annually. It also places a tremendous strain on the health care system. Ulcers can develop after mild injury, but mostly in diabetes sufferers. They may also form as a result of poorly fitted shoes, especially on the sides of the foot. Chronic high blood sugar levels are also associated with serious complications in diabetes sufferers. While foot ulcers can be quite serious, most patients respond well to treatment. Early diagnosis and treatment are necessary to reduce the risk of complications. Although not all ulcers are infected, neglecting them will most definitely result in infections. Limb-threatening diabetic foot infections are usually polymicrobial, which means that it is caused by several different types of micro-organisms. Keeping off your feet as much as possible is also very important. For more information on Healing foot ulcers,please read Heal Diabetic Foot Ulcers Naturally. The development of foot ulcers in patients with diabetes mellitus have several components; neuropathy, biomechanical pressure, and vascular supply are but a few. If you suffer from diabetes, you should be aware of how to prevent and treat foot ulcers. Proper foot care is very important. Taking care of your feet is vital if you have diabetes. Research has proven that people with diabetes who take good care of their feet and protect them from injury are much less likely to develop foot ulcers. Invest in good quality, comfortable shoes and avoid walking barefoot at all costs. The removal of all necrotic tissue and foreign bodies down to viable tissue. A wheelchair, crutches and/or specialised shoes, insoles and socks are used to reduce pressure off of the ulceration. Mild to moderate infections need to be examined daily, so that they may be controlled. Be sure to keep your blood sugar levels under tight control. This will help you to heal faster. With a proper diet, exercise and correct care, there is hope for those suffering with foot ulcers. Self-care is vital and can be very effective. Don’t know when to call a doctor? Be sure to call a doctor if our foot ulcer is black, white or blue. For more treatment information on this condition please look at, Secret Diabetic Foot Ulcer Cure Finally Revealed.